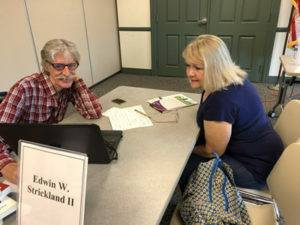 Ancestors Road Show – Connecticut Professional Genealogists Council, Inc.
What is an Ancestor Road Show? Members of CPGC are proud to continue support of the Donna Holt Siemiatkoski Acquisition Fund through a project called Ancestors Road Shows. 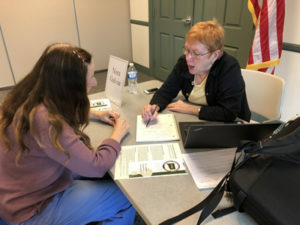 In conjunction with a local host, CPGC members provide individualized consultations to the family genealogists in attendance. During consultations, each CPGC member volunteer speaks with individual attendees and offers suggestions for overcoming research problems. Our professionals are very helpful in guiding people with their family research. In return for the Road Show program provided by member volunteers, CPGC accepts a donation of $250 to the Donna Holt Siemiatkoski Acquisition Fund from the local host. This ensures that the Fund will continue to support Connecticut’s libraries for many years to come. To begin the planning process for an Ancestors Road Show, contact our Road Show Coordinator at roadshow@ctprofgen.org. We will work with your schedule to set up a time for the event and we will offer guidance for organizing and promoting the event. The Ancestors Road Show can be an independent event or part of a larger Family History Day or Town Hall Open House event. For more information, please contact our Road Show Coordinator.